A shortage of truck drivers that has been simmering in the United States for years has reached a full boil, causing anxiety from small factories to the Federal Reserve. Trucking companies have responded by raising wages and boosting their hauling fees. Their customers then have to choose between smaller profits or passing along the higher costs, which fuels inflation. Some producers have encountered a shortage of trucks, which can tap the brakes on economic growth. Don’t expect the problem to go away soon: In the tight labor market, construction and manufacturing jobs will continue to lure would-be truckers. 1. How bad is the driver shortage? The truck-driver shortfall swelled to a record 296,311 in the second quarter of this year, according to FTR Transportation Intelligence. The change was swift: In the fourth quarter of 2015, less than one-tenth that many driver jobs went unfilled. 2. What caused the problem? The root cause dates to 2004, when federal rules changed for measuring whether drivers had reached the maximum workday: driving 11 hours in a 14-hour period. The new rules said that the 11 hours begin the moment a driver gets behind the wheel; prior to that the clock would stop whenever a driver cooled his heels at a loading dock. (Just 6% of drivers are women.) Because drivers couldn’t work as long, more of them were needed to cover the routes. This started a driver shortage interrupted only by the recession in late 2007. And the population of truckers is aging. Only 20% of drivers are in the 20-34 age bracket, compared with 30% for construction workers. That’s in part because drivers have to be at least 21 to cross state lines, under federal rules, eliminating longhaul trucking as a viable vocation for new high school graduates. 3. Why has it suddenly gotten worse? Blame the strong economy. For-hire truck tonnage rose 7.9% in the first half of 2018 from a year earlier, more than double the gain for the same period in 2017, according to American Trucking Associations. On the supply side, with the unemployment rate hovering around its lowest level in almost half a century, construction and manufacturing have an easier time attracting workers than trucking, which can require weeks on the road at a stretch. Payrolls climbed 4.1% in the past 12 months ending June for construction and 2.3% for manufacturing while truck transportation lagged with a 1.7% gain. On top of that, a newly enforced federal requirement that truckers use electronic logging devices has stopped drivers from fudging their hours. That’s reduced capacity between 5-10%, according to various industry estimates. 4. Can anything be done? The industry has been lobbying to allow people younger than 21 to drive interstate routes; a bill on this was introduced in Congress in March. 5. Who’s feeling the pain? Anyone who needs to move goods. Long-distance trucking costs advanced 9.4% in June from a year earlier, according to the Labor Department, the largest increase in nearly a decade. So trucking has been a gloomy part of many second-quarter earnings reports. And driver scarcity can get so bad that it hurts business. Revenue at a unit of Knight-Swift Transportation Holdings Inc. plunged 17% in the second quarter because it lacked drivers. Trucking companies, freight brokers and railroads have been able to raise prices. 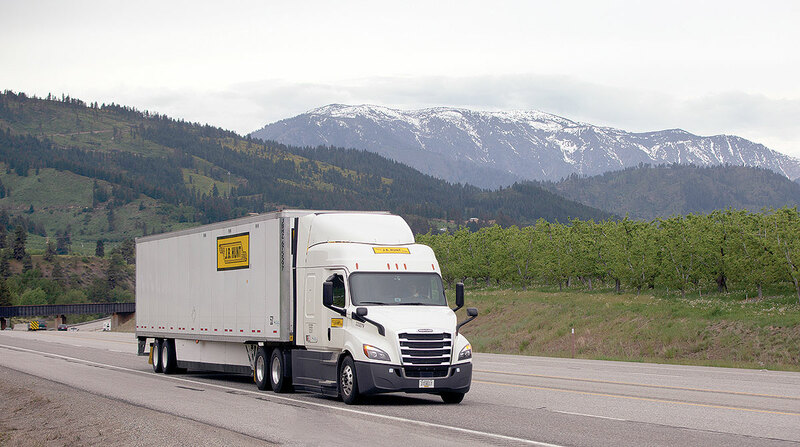 Earnings more than doubled at Werner Enterprises Inc. in the second quarter and jumped 55% at J.B. Hunt Transport Services Inc., the largest trucking company by market value. Norfolk Southern Corp., a railroad in the eastern United States, posted a 46% increase. And drivers are enjoying the perks of being wanted. 7. How are drivers benefiting? The median salary for truckers increased 15% from 2013 to 2017, according to ATA, and some companies are offering sign-on bonuses as high as $10,000 to attract drivers. Larger companies have set up driver schools to recruit candidates. Carriers also are trying to get drivers home more often to reduce the 90% annual turnover rate that is typical for longhaul truckers. And customers are reducing waiting times and making rest areas more accommodating since drivers, particularly those who own their own trucks, can be picky about which shippers they service. 8. What does this do to the economy? 9. Are driverless trucks the answer? Autonomous vehicles certainly would avoid the driver-shortage problem. But while major vehicle makers are working on the technology, most analysts and freight companies don’t expect driverless trucks will be turned loose on the roads for decades.